Since I’ve been using dry yeast for the last few brews, I haven’t had to make a starter. Starters are sort of miniature wort (about a quart or more) that get your liquid yeast reproducing, so that when you introduce it to your real wort, you can be assured that you will be adding enough yeast to finish the fermentation. While the yeast are reproducing, they’re metabolizing aerobically, which means they need oxygen as much as you do on the treadmill. Enter the stir plate: a device which spins a magnetic stirring rod in your starter, introducing oxygen to the wort, just as you do by shaking the wort in the carboy before pitching the yeast. I used to regularly use these devices for mixing reagents in chemical reactions while doing research at Bucknell, but lab quality stir plates cost $100 or more. There are many guides to building DIY stir plates already, advertising build costs ranging from free to about $20. My build doesn’t really cost $7, because you can add or even subtract features, and you may or may not have access to parts that I did, but it cost me about $7 and the name sounds snappy. I wanted to get into DIY build projects, and this is an easy project to start with. I would encourage any homebrewer to try this out too, not just for the device’s utility, but for the same reason I’d encourage anyone who doesn’t brew to try out homebrewing. It’s fun, it’s accessible, and it’s cool see the stir plate going and knowing that you made it happen. The idea is that you can mount a powerful magnet to a fan, power it with a small power supply, and place it under a platform to support the container holding the starter. You can control the fan speed using a potentiometer or rheostat (basically a variable resistor) that cuts the voltage through the fan. 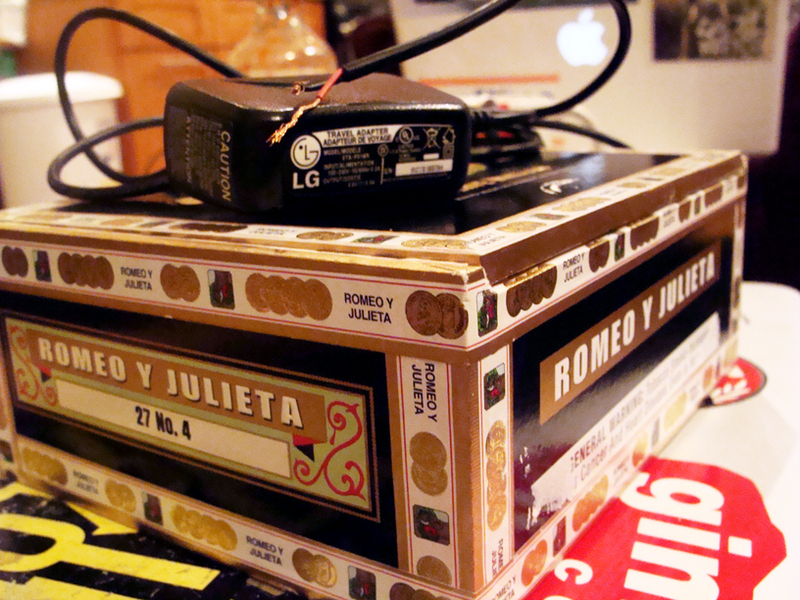 The power supply can be an old cell phone charger or similar device, the fan an old computer fan, and the platform a cigar box. Powerful magnetics be had from the innards of a junked computer hard drive. You could make other choices – plastic cheese containers and model train power supplies were popular choices in the links above. 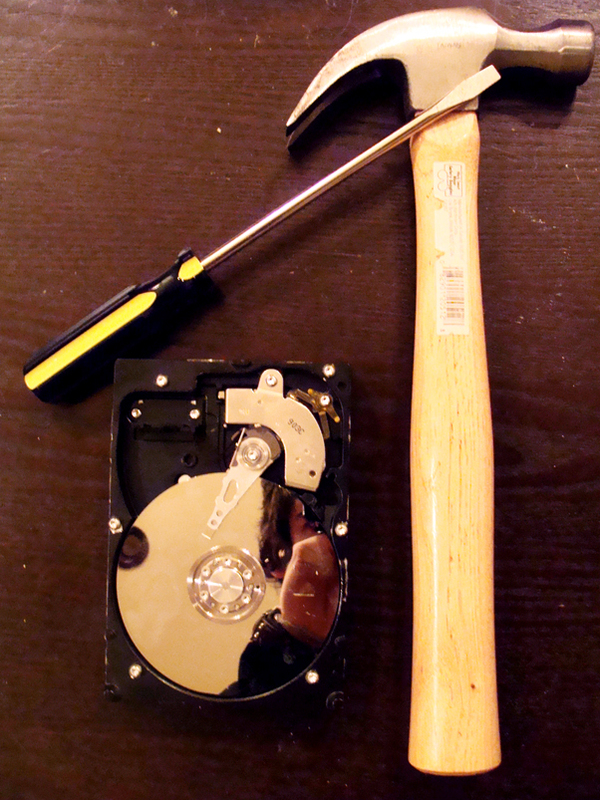 Hard drives are surprisingly easy to disassemble even if you don’t have the right tools (a Torx screwdriver – I’m not sure what size). I took off the top of this drive simply by hammering a screwdriver under the cover plate and prying it off. The plate will snap around the screws, exposing the bracket that holds the magnet. If you have two sets of pliers, you can get the magnet by bending the bracket back until the magnet pops off. There is another bracket and magnet underneath, although I couldn’t get at it with the pliers. The configuration of the magnet is critical, so it may help to use two, or at least have a second magnet on hand to experiment with. Alternatively, neodymium/rare earth magnets can be bought cheaply, or can be salvaged from other things like magnetic name tag holders. I also hacked up the case fan I’d be using. Since we’re enclosing it in a box with no vents for circulation, having the fins attached will put additional strain on the motor. This could be advantageous in slowing down the fan’s rotation, but it could also make the fan give out at a younger age. What ultimately influenced my decision, was that I wasn’t planning to bolt down the fan; I was just going to glue it to the bottom of the box. I didn’t want the fan trying to lift off or otherwise jostle out of the glue, so I decided to cut off the fins. In just about all cases it probably has very minor effects one way or the other, and the fan can easily be replaced or bolted down or whatever is necessary in the event something goes wrong. Both your power supply and case fan should have stickers on them that tell you the voltage and current specifications that they give/take. My power supply puts out about 5V and 0.9A DC while my case fan takes 12V at 2.3A DC. Ohm’s law describes the relationship between voltage, current, and resistor in many circuits (including ours). The law states that V=IR, so my case fan has 12 ÷ 2.3 = 5Ω (approximately) of resistance. The fan probably spins around 4500RPM in normal operating, and by my guess we want to be able to bring it down to somewhere between 100 and 300RPM. The fan’s speed is determined by the power delivered to it, which is equal to the voltage it receives squared, divided by the resistance (i.e. P = V2 ÷ R). This means our fan is used to receiving about 28W of power. 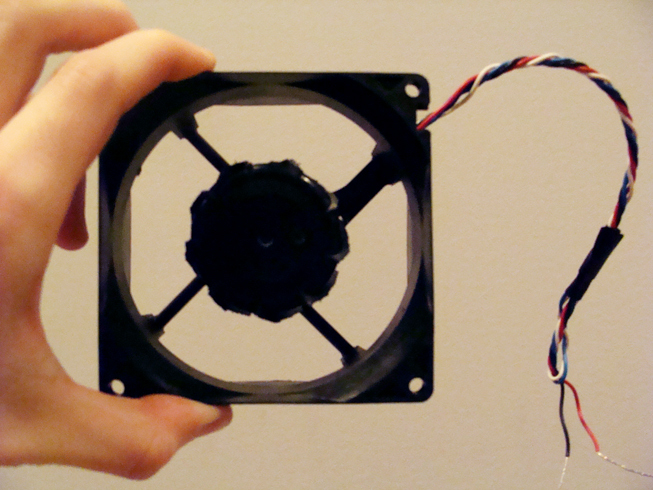 Assuming the rotation is proportional to the power, that means the fan spins at about 160RPM per watt. Therefore we want to be able to deliver about .5 to 2 watts to the fan, or (again using the equation for power) we want to deliver 1 to 3 volts across it. We are selecting a (variable) resistor to put in series with our fan. In order to choose the right resistance, we need to know what the voltage drop across it will be. In order to know this, we need to know the current through our circuit. The current in our circuit depends on the resistance in the circuit. This sounds a little circular and confusing, but all it requires is a little algebra. Resistors in series add, so the current through the circuit will be I = Vsupply ÷ (Rresistor+Rfan), and the voltage drop across the resistor will be Vdrop = IRresistor = VsupplyRresistor ÷ (Rresistor+Rfan), or solving for Rresistor = VdropRfan ÷ (Vsupply + Vdrop). I have a 5V supply, and want to deliver 2 to 3 volts, so I will require a 2 to 4 volt drop across the resistor, requiring between 3 and 20Ω of resistance. The power that will be dissipated (you should be able to calculate this) will be between about 0.5 to 2 watts. Therefore I chose a rheostat that can deliver up to 25Ω resistance and can dissipate up to 3W of power through heat. I did a lot of rounding through all this, and when do more precise calculations (keeping more decimal places), I found I’d be dissipating as much as 4W of energy through the rheostat. This is quite a bit more than it’s rated for, so my rheostat may break prematurely, and I will have to also be vigilant about it possibly overheating and scorching the cigar box. Just keep these things in mind when constructing your own. There are more advanced electronics to handle this voltage adjustment problem more elegantly, but considering I’m not even putting a switch on my plate or a knob on my rheostat for easy adjustment, this is more investment in time and money than I’m willing to make at this point. Keep in mind that the effect of a stir plate can be approximated by simply swirling your starter for 10 or 15 seconds every 15 minutes for the 12 to 24 hours that your starter is growing, so if this project fails, you’re not exactly without a paddle. So before I persuade you of the futility of all this business, I drilled a a hole in the box, threaded the wire from the cell phone charger through it, glued the fan to the bottom of the box, and hooked up the electronics. My rheostat has three terminals, and I’ll refer to them assuming the knob on the rheostat is facing me. After stripping the wires on the phone charge (exposing about an inch of wire), I twist the strands of the positive and negative wires. I then take the twisted positive wire and wind it around the left hand terminal of the rheostat. Similarly, I wind the positive wire from the fan around the middle terminal of the rheostat. The negative wire of the fan and charge get wound together. I put a right angle bend in the negative wires, nest them together like linked elbows, and then wrap then ends that stick out around the straight portions. Then I finally carefully wrap all the exposed wires in electrical tape. You can buy heat shrink to slip over the exposed wires to do a better job of covering them, but it is more expensive. I ordered a magnetic stir bar off of Amazon for $7. 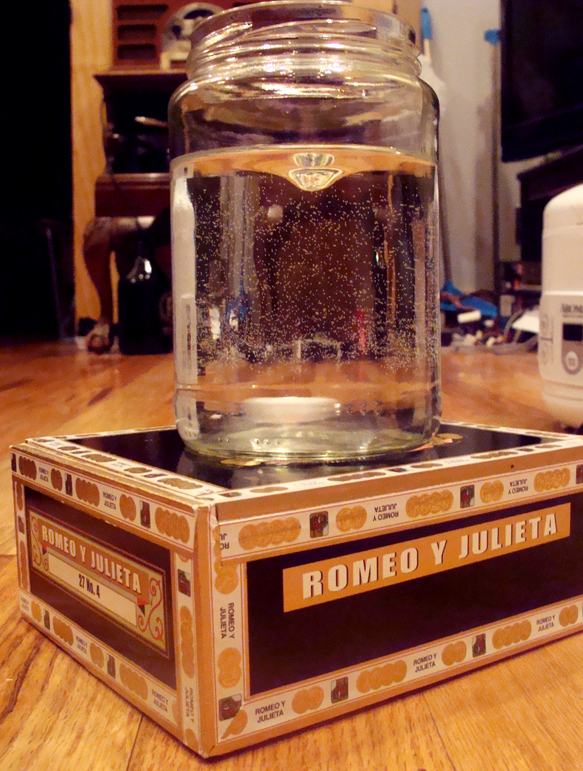 Since this technically isn’t part of the stir plate, I take license of not factoring it into the cost. It takes a bit of finagling to get the thing to work, but it does work. 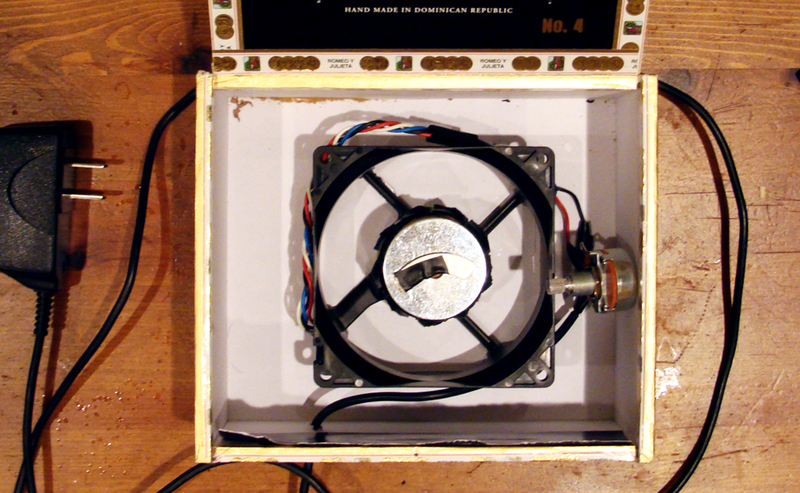 Since the rheostat is in the box, I have to start the magnet spinning before closing the box and placing the starter on top. I simply slow down the fan with my finger, hold the jar above the magnet to let the stir bar lock phase with the magnets, and then quickly close the box and set the jar on top while the bar is still spinning. With a bit of finesse, the magnets won’t lose the bar. Currently I am teaching electricity and magnetism, and we have just begun working on circuit analysis. The timing couldn’t seem to work out better, and given the amount of times I make references to “going to Radioshack to buy a battery/capacitor/resistor” in order to emphasize a point about how to think about different electrical quantities, it was high time I showed them a demo to illustrate exactly what I mean. They seemed to enjoy it, as did several other grad students in the office. One of my more curious students inquired as to the purpose of such a device. When I told the class that it was to help me brew beer, one of them threatened to turn me in for selling beer to minors. I joked that the plan must be to blackmail me for better grades. This entry was posted in beer, equipment, learning and tagged DIY, narrative, stir plate, yeast on March 14, 2013 by Dylan Bargteil.